Kandy SC wins the Caltex Clifford Cup | Welcome to Chevron Lubricant Lanka PLC. 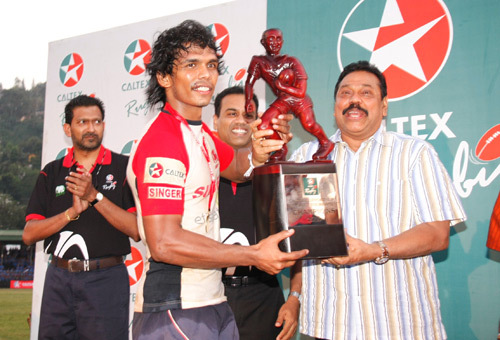 Kandy Sports Club skipper Fazil Marija receiving the Caltex Clifford Cup Champions trophy from His Excellency the President Mahinda Rajapaksa who was the Chief Guest at the Caltex Inter-club Knockout Tournament for the Clifford Cup 2010. The finals was held on the 1st of August 2010. Kandy Sports Club clinched the rugby double by beating the challengers Navy Sports Club by 26 points (four tries, two penalties) to 11 (one try, one drop goal, one penalty). At half-time Kandy was in the lead by16-6. The match was played before a record crowd of over 20,000 fans at the Bogambara Stadium, in Kandy. Also in the picture are Mr.Kishu Gomes, Managing Director & CEO and Mr.Bertram Paul, GM –Sales & Marketing of Chevron Lubricants Lanka PLC. The Clifford Cup Tournament has been sponsored by Caltex for 12 consecutive years.